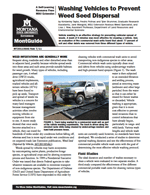 Vehicle washing is an effective strategy for preventing vehicular spread of weeds. A wash of 6 minutes was most effective for cleaning a vehicle. And, an evaluation of five commercial wash units found that about 77 percent of soil and other debris was removed from three different types of vehicle. Extension bulletin from Montana State University. SKU MT201106AG.